Anyone who has experienced success selling to multiple retail customers has cracked the code. They have perfected their unique retail selling story. Each may have developed their own wildly divergent strategies and tactics depending on category, product lines, selling style or historic sales cycles. One common thread: success in getting their brand on the retail shelf. This post is no different. NewPoint helps emerging brands develop their retail selling story and pitch deck, and we’ve learned a lot after working on pitch decks for a couple of decades for NewPoint clients. So the one fact we’ve all probably learned from talking to retail food buyers? As gatekeepers to the shelf, they are not sitting there with an open spot on their plan-o-gram (POG) waiting for your product. You are going to have to displace a competitor to get on the shelf. This is where an excellent retail selling story is essential. For the uninitiated, a typical retail selling story takes the form of a “pitch deck” or set of slides. Ideally, this “deck” creates a compelling argument to displace a competitor and add your (or more of your) product to the POG. A good selling story touches on everything involved in moving a product into the cart and through the checkout lane. By extension, a good pitch deck should work just as hard after you’ve left the room. A good, compelling argument based in strong, proprietary “intel” should make an impact on the prospective customer and provide them with tools they can use to help them with their job. One reason emerging food brands seek NewPoint’s help in developing their pitch deck: A good pitch deck also levels the playing field. Think of it this way: You will no doubt be pitching against, and potentially making an argument to displace, a “Big Food” brand. To that end, the look and feel of your deck should be on par with any world class professional retail presentation. At the same time, NewPoint’s role is to digest the intelligence mined in all 6 key components and weave your storylines with strategically developed, branded copy into that killer pitch deck. Roll up your sleeves and get ready to do some homework. Have you ever internally cringed when a salesperson is in the middle of a canned pitch that is so tone deaf to your business and specific needs that you feel the urge to shut them down? I have. Unfortunately, I’ve also been that salesperson. Years ago. I was so focused on the features and benefits of my product, but, all the while, was oblivious to my prospective customer’s worldview. Let’s not be that guy. The first thing we do when we are preparing for a meeting with a buyer? Visit a store. Go to the buyer’s plan-o-gram. Know it inside and out: SKU count by brand, products, flavors, price points, packaging, features, benefits. Everything. Then do the same for as many of the food buyer’s competitive supermarket POGs as you can. Got a meeting with Kroger? Hit your POG at Whole Foods, Walmart, and HyVee. 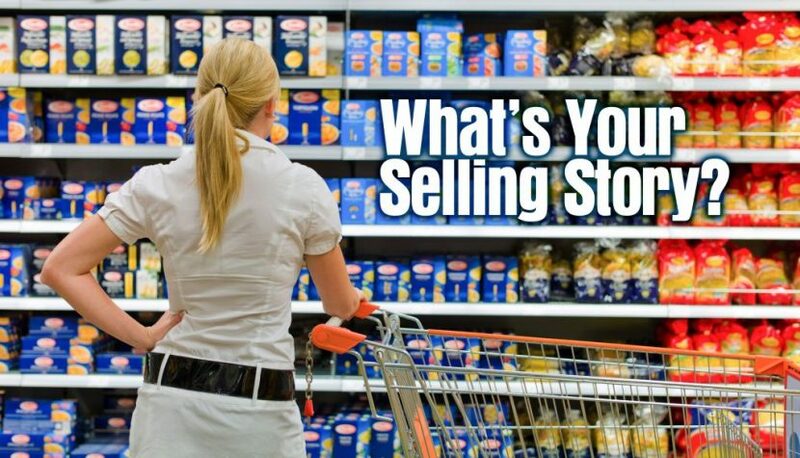 We can tell a lot when we visit a supermarket with a client. The best clients? The ones who are spot-on in their game? These clients pick apart their retail POG product-by-product, detailing everything from how one product/brand is the leader, how another should not be there, to what flavors/styles they have too much/not enough of, to packaging, price points, and ingredients. In short, they are experts in their category. 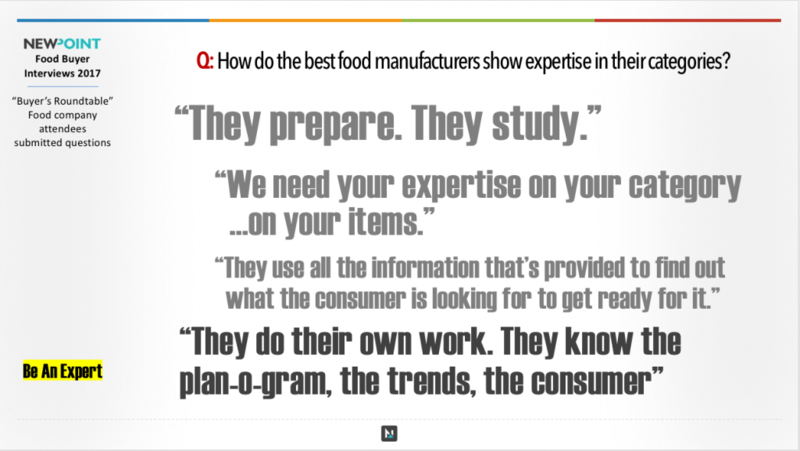 This is what the food buyer is looking for: expertise. I’ve seen these hundreds of times in my day-to-day work and witnessed this working first-hand. The best insights only come from deep category expertise. With Insight comes expertise. With expertise comes respect. With respect comes partnerships. Next, dig into what you can about the supermarket corporate initiatives that align with your brand and company values? The goal is to weave their goals, programs, etc. into your branded selling story. Are they active in local charities? Do they have an active CSR (corporate social responsibility) or support causes/charities that you do as well? Are they moving toward non-GMO, clean label, and transparency in sourcing or sustainability? Develop the narrative that aligns your corporations. At the very least you should be illustrating that you know and care about the company you’re hoping to partner with. NewPoint’s team may look at corporate annual reports, or retail publications like SuperMarket News, Progressive Grocer, or Food Dive. Don’t forget good old-fashioned Google search and Google news. Put yourself in the buyer’s shoes for a moment. Wouldn’t you want to talk about the buyer’s goals for their POG, knowing that they are not only competing with the supermarket competitor across the street, but also within their own store? If their POG does not produce sales and turns on the shelf, the buyer for the category next door may be awarded their shelf space. 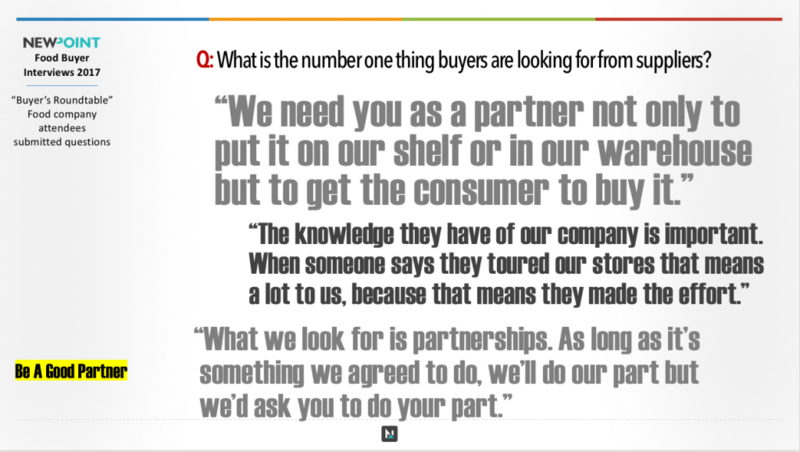 NewPoint learned all these tidbits from experience, but also when we conducted a survey of buyers, then interviewed just under a dozen, and finally compiled the information in my book, Moving Your Brand Up the Food Chain. Once again, homework is key. Following the same mantra as above: be the expert in your category. Keep tabs on everything associated with your product category. Information sources vary depending on your category. Your category association may have research supporting an attribute that aligns with your product or brand – or the retailer’s values or corporate initiatives. To help make your “local” argument, email me. I’ll send you Chapter 2 of my book: “Moving: Why Now for Local.” Lots of great facts, figures, and data to weave into to your selling story. You may need a great argument to convince the gatekeeper to displace a competitive brand in the POG, but, at the end of the day, a retail food buyer knows the consumer is king. We work to cultivate good, statistically accurate, proprietary consumer data or feedback about taste, features (NON-GMO, gluten-free, paleo, reduced fat, etc. ), packaging – anything related to the overall category. Then we dial into “why” they love your product. 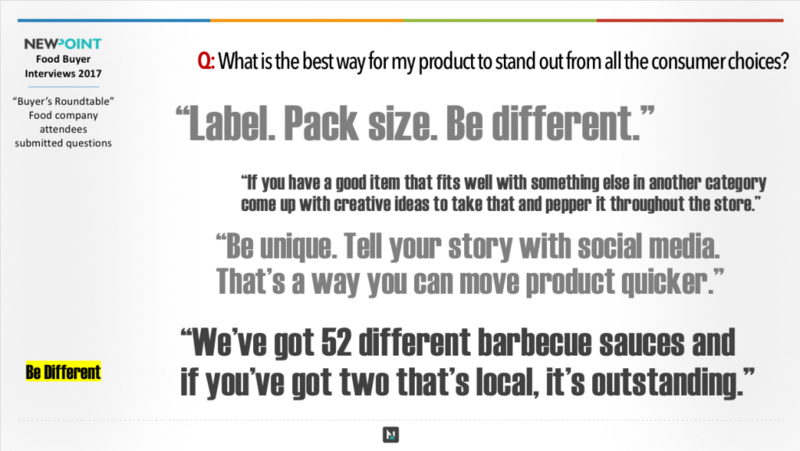 500 people saying why they prefer your brand is a good thing. Targeted, boosted, online, and social media surveys can help get that job done. Questionnaires at in-store demos or at your farmer’s market booth are other low-cost options. Every brand tells a story and yours is no different. Obviously, as a strategic marketing firm, we spend a lot of time talking about the importance of a strong, differentiated brand. This isn’t about your product or your manufacturing processes specifically – although those may be strong components of your brand story. This is the story of how your brand is relevant to the buying consumer, and relative to the competition. In other words, it’s about why a consumer will choose your brand over the competition. This is a great spot to develop a narrative that aligns your brand/company with the buyer’s company. After harvesting your retailers’ insights, gleaning the market and trends about products in your category, and threshing out why consumers will be excited about your products and your brand, now is the time. You finally get to talk about yourself, your wonderful products, your brand story. But try to do it in a way that considers the good work that comes from being a good partner and an expert in your category. Go for it! The majority of retailers we surveyed and interviewed said they believe the food vendors in their POG have at least as much responsible for getting the product off the shelf and through the checkout lane as they do. 50/50. That sounds like a partnership. Knowing that, it seems logical this is a great way to close your selling story – with your plan to support your end of the partnership. Do you have a marketing plan the details targeted social media marketing, FSIs (Free Standing Inserts), coupons, event marketing, demos, ad dollars or shelf promos, shopper marketing tools (decals/coupons/shelf talkers), and so on? In short, how do you envision the partnership working? Converting Brand Champions, One Complaint at a Time Are Food Distributors & Brokers Screwing Up Your Selling Story?